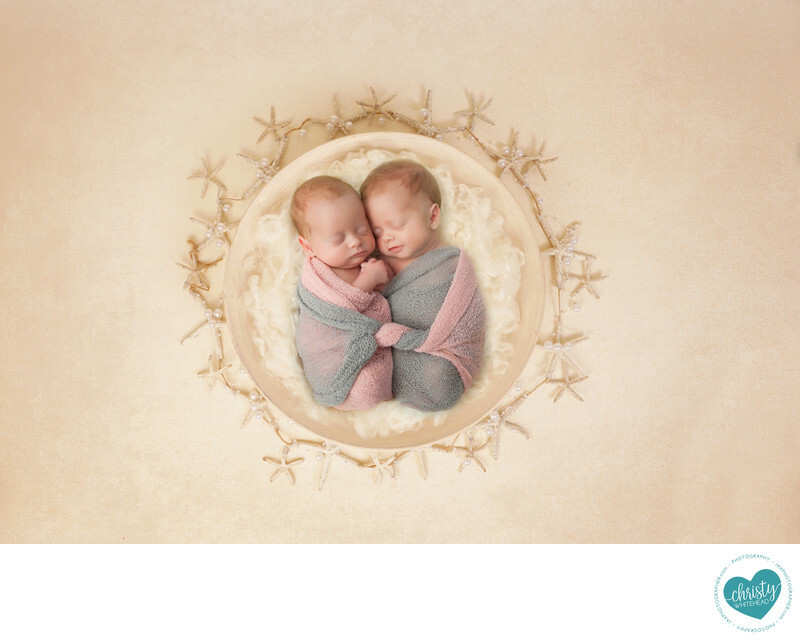 Twin newborn girls, beach themed - Newborn Photography | Schedule Your Newborn Shoot Today! Professional printing makes a world of difference. I do family portraits with my kids and husband every year. The day before school starts, my daughter tells me she wants a print of our family photo to put on her binder. In a crunch for time, I sent the image to Walgreens. My daughter and I rushed down to pick up the 8x10 and to my horror our skin tones were a neon orange and we looked blown out/details lost in our face. I mentioned it to the clerk who told me their photo printers are calibrated. My friends, they are not. These same images had been sent to our professional lab to be printed (printed for gifts for family members) and they did NOT look neon. These professional labs are not color correcting, they know what they are doing and I didn’t request corrections. The corner stores and box stores are run by people who do NOT understand good quality printing, color and consistency. Even my 8yo daughter remarked about her neon skin tone. This is why I would NOT trust anyone to my prints. When researching photographers and their pricing, you might notice that some packages include digital photo negatives, or they may give you that option as an add on to your package. This allows you to archive the images on your computer or share them on social media. But if you are planning to rush to the box store around the corner to have those portraits printed, you may want to consider a few things. Yes, you have just paid a professional photographer to take your photos and you want to save some money but by not getting a professional to print your photos, you won’t be getting the full effect of the time and effort that went into those images. And ultimately, you chose that photographer, most likely because you loved how their images looked and their quality---but printing those images anywhere means you won’t get the look you paid for. There is a reason that your photographer spends hours editing your photos. They aim to perfect the colors and sharpness of the images so that it is a work of art and not just another selfie with bad lighting. Professional photographers, like our studio, not only pay for professional monitors made to understand photography/color/light, but have our screens calibrated to get the best possible result possible. Your local photo lab is not a professional photo lab and the person who will print your photos most likely will not have a background in photography or a trained eye—sometimes they are barely out of high school. Your photographer has access to a professional lab and has built a strong working relationship with them. These professional printers use professional grade paper, inks and machines that you won’t find at a regular store, which is why they cost a little extra. Trained technicians also monitor the printing process to ensure that you receive the very best quality of images. By investing a little extra in your prints with your photographer, you ensure that they last longer because better materials were used. There is of course a place for your 1 hour-print labs—like when you need to do a quick craft project-- but if you’re looking to print portraits for the walls in your home then havingn your photos professionally printed is well worth the investment. At our studio we encourage you to order your wall art through us so that I can ensure the quality of the image you receive. If it comes in and doesn’t meet our standards, I reorder! If you want digitals for backup or to share on social media, no problem—you can get those as well.